How games depict death and family relationships is immensely interesting. These two subjects can be very emotionally evocative for players, particular when a game's protagonist reacts strongly to both. Ezio Auditore, the protagonist of Assassin's Creed 2, is surrounded by death and is initially motivated to become a trained killer by several deaths in his family. The opportunity to evoke powerful sensations in players through Ezio's loss and deadly task ahead is apparent. Unfortunately, AC2 squanders much of its narrative potential with inconsistent messages and obscure motivations. Desmond, the modern day lead character reliving Ezio's memory in Assassin's Creed 2, first encounters the Auditore family when Frederico Auditore comes to Ezio's aid during a street brawl. Frederico teaches Ezio how to fight and loot the bodies of unconscious (or dead) enemies. This tutorial-family relationship, to the annoyance of some, is repeated 'ad nauseam' as the first few hours of AC2 is spent completing mundane tasks for Ezio's family. Ubisoft attempts to convey strong sensations of family bonding by transforming the day-to-day tasks of the Auditores into player tutorials. When these lessons lose their utility, so do Ezio's familial relationships. 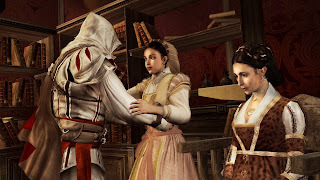 When his father and two brothers are killed, Ezio escorts his mother and sister to the Monteriggioni villa where they cease to play any significant part in the story. Maria is forever praying and Claudia only asks her brother if he wants to look at his finances. Over the 23 years the game takes place, neither ages, moves from their room, or responds to Ezio's new profession in any way. His transformation into an assassin occurs while his familial relationships disappear. What could be a powerful depiction of loss is abandoned when Ezio displays no grief for his brothers and father and spends no time with his surviving family members. What then motivates Ezio? Why does he choose a life of danger instead of leaving Italy with his mother and sister? He could be pursuing revenge, but his role as an assassin protecting the Italian people and stopping the Templar quickly subsumes all of his attention. Ezio's Uncle Mario, also an assassin, consistently plays the role of an ally, not a close family member. When those helping Ezio along the way reveal themselves to be fellow assassins, it becomes clear this order of killers has largely replaced his family. There is even a cute 'leap of faith' initiation. While this moment does complete the plan his father Giovanni had laid out, his memory is given but a passing glance before the more important task is discussed. The player is left with one solitary goal, uninformed by familial relationships. Death is treated with similar confusion and inconsistency. 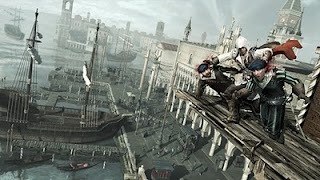 For example, Ezio collects feathers after Petruccio's death and deposits them at the Villa. His motivations for doing this are muddled. It could be an effort to draw Maria out of sorrow induced shock. At 50 collected feathers, Mario tells Ezio to give up on his mother's recovery and "focus on more important things." It also unlocks a new mace. When all the feathers are collected, Maria wakes from her stupor and thanks Ezio for not forgetting about her, also unlocking a new cloak. She then sits in the room, equally devoid of agency. For such an immense effort, her reaction and reward is absurd. Most players will never collect all the feathers, so these scenes are largely superfluous anyway. It is more powerful to assume Ezio collects the feathers to express his own mourning. Attaching a monetary incentive to the feathers, however, obscures Ezio's motivations. For the player, collecting feathers is not a mourning, it's profit making. Ezio displays no meaningful emotional alternative that would reinterpret the player's selfish interest. Yet during some moments, death is treated is as emotionally significant. Maria confirms from Ezio that the Auditore deceased were given a proper funeral. Also, each assassination ends with "Requiscat in Pace," with Ezio performing last rites and telling his enemies to rest in peace. How does one earn such a formal treatment? The men he kills are evil Templars and have shown no reason to deserve respect. Perhaps this is Ezio's own ceremony reserved specifically for the death of enemies, a display of personal gratification. But at one point he gives this blessing to a dying thief ally. If death should be treated with respect for everyone, why then does Ezio never give last rites to murdered guards? The depiction of death evokes little response from players when their protagonist offers only contradictions. There are a few moments in Assassin's Creed 2 where Ezio seems remorseful about his new profession, wishing he did not have to kill. Yet he goes about his duties with a seemingly eager single-mindedness, enjoying the monetary rewards along the way. It is as if Ezio is merely an avatar, acting out the desires of an emotionally distant other. Which is exactly what he is. Despite significant changes from the first Assassin's Creed, the sequel still relies too heavily on Desmond to draw interest, leaving the individual assassin's story to languish. When Desmond wakes up from his genetic memory, visual remnants of the past persist. Emotional remnants do not. Desmond never behaves as though he were emotionally invested in Ezio's life. There is no mirage of Giovanni, no sudden remorse for killing so many people. His attitude towards death is just as vapid when he kills actual people himself. Like the player, Desmond's time as Ezio holds no greater meaning besides the exhilaration and mystery surrounding an assassin's destiny. With inconsistent and muddled depictions of in-game relationships and behavior, a potentially memorable character and evocative story becomes watered down and wasted. The other wrinkle in this is that Desmond is also related to Ezio (and Altair) but doesn't seem to care all that much. Granted, I don't spend my time thinking about my 500 year old relatives, but I'm also not a character in a story about the destruction and displacement of a family and and the subsequent, if nominal, revenge quest. The more I think about ACII, the more it seems like a Michael Bay movie to me. It's a lot of fun to see and play, there's some suspenseful plot movement, but there's not a lot of narrative depth. I'm not convinced that Ubisoft was trying to do anything more than that, which is fine. But if they were, I certainly agree that they wasted plenty of opportunities to follow up on the themes you identified. Good point on Desmond's own ancestors. I should have touched on that subject. I find is strange he doesn't empathize with these characters more, espcecially if we "the player" are supposed to.